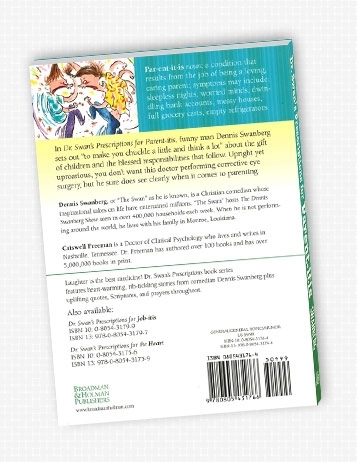 In "prescriptions", funny man Dennis Swanberg sets out to make you "chuckle a little and think a lot" about how things are really supposed to be in regards to parenting. Wise and wacky, his insights help us realize that being a parent can be fun and rewarding at the same time. 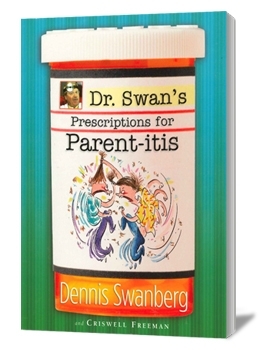 In Dr: Swan's Prescription for Parent-itis, funny man Dennis Swanberg sets out "to make you chuckle a little and think a lot" about the gift of children and the blessed responsibilities that follow. Upright yet uproarious, you don t want this doctor performing corrective eye surgery, but he sure does see clearly when it comes to parenting. Dennis Swanberg, or 'The Swan" as he is known, is a Christian comedian whose inspirational takes on life have entertained millions. 'The Swan" hosts The Dennis Swanberg Show seen in over 400 ,000 households each week. When he is not performing around the world, he lives with his family in Monroe, Louisiana. Criswell Freeman is a Doctor of Clinical Psychology who lives and writes in Nashville, Tenn essee. Dr. Freeman has authored over 100 books and has over 5,000,000 books in print.